Carrol Wilson Miner, 91, of North Stonington, CT, passed away peacefully at his home on Sunday, February 10, 2019. Born on January 20, 1928 on the family farm in North Stonington, CT he was the son of the late Maurice C. and Lucy P. Miner. 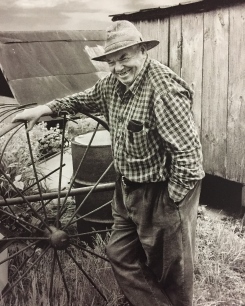 Carrol spent his entire life on the family farm in North Stonington. For the last several decades, he and his late brother George and later their sons ran the farm as the G&C Miner Farm. Carrol was a life- long member and Past Master of the North Stonington Grange. In his younger years he was active in 4-H. He graduated from NFA. Carrol will be remembered for always being quick with a laugh, a hard and tireless worker, big smile, and he was still riding a tractor and raking hay past his 90th birthday. He leaves his wife of 61 years, Elizabeth (Blake) Miner; daughter Marilyn Morris (Steven) of North Stonington, son Orrin Miner of North Stonington, daughter Mildred Moreash of Plainfield, CT and daughter Dulcie Ilgenfritz (Chuck) of West Kingston, RI; grandchildren Mindy and Danial Morris, Allison and Jonathan Henson and Jessica, Sarah and Alex Ilgenfritz; nieces and nephews. He was predeceased by his daughter, Helen J. Henson and son-in-law, Mark Henson and by his brothers Maurice and George. Funeral services will be held on Thursday February 14, 2019 at 11:00am at Buckler-Johnston Funeral Home, 121 Main St., Westerly RI. Burial will immediately follow at Union Cemetery in North Stonington. Calling hours will be held on Wednesday, February 13, 2019 from 4 p.m. to 6 p.m. at Buckler-Johnston Funeral Home, 121 Main St., Westerly, RI.